I'm a little disappointed by this book. Mostly because the title is misleading for 2 reasons. 1) It really doesn't have anything to do with Alice in Wonderland except for the name Alice and a cloud shaped like a white rabbit and 2) They're not real zombies. They want to eat your soul, not your flesh. They're more like evil spirits than zombies.... Sombies. Oh, and only some people can see them. Another fun twist. They're spirits so you can only fight them in spirit form, but if your spirit is injured it shows up on your body. Am I the only one who thinks this is unfair? As I was reading I thought it would have been better if the characters were adults. I know it's a YA book, but why are teenagers doing all of the work? On top of the fighting something not that many people can see, they still have to go to school and get in trouble. Also, it made me feel pervy having a crush on fictional High School characters with douchey nicknames like "Bronx" and "Frosty." I did think it was entertaining anyway and it was a quick read, but for the most part I felt like it was underdeveloped and the writing could have been improved. Just because it's a book for teenagers doesn't mean that it needs to be cheesy at all. I guess I was hoping and looking for something with more meaning when it may not have been meant to have it. I don't know... maybe I'm outgrowing certain types of YA novels? I shudder at the thought. This is only the first book in the series so I'm hoping the next one will be better. 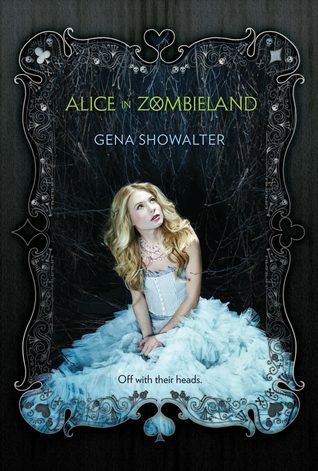 Through the Zombie Glass (White Rabbit Chronicles #2) comes out on September 24, 2013.